Welcome to New Bohemia. In the boozy Brooklyn atmosphere of Bar Matchless, the Kings and Queens Showcase spotlights the latest wave of East Coast indie musicians. At the forefront of the action stand the event's hosts and reigning monarchs, Christopher King and Sylvana Joyce. Key members of the band Sylvana Joyce and The Moment (SJATM), they exemplify the growing retro-fresh trend, their sound an eclectic fusion of old-school gypsy rock and modern sensibility that makes the listener simultaneously nostalgic and invigorated. If you don't recognize their names, better learn them now, because these folks are going to be huge. Equal parts dynamo and siren swirling beneath a petite Eastern European exterior, lead singer and keyboardist Sylvana is basically a human carnival. Her ability to inhabit a song's lyrics and create several diverse characters within the same set while retaining her own personal energy reminds me of the great vaudeville belters -- a Nora Bayes or even a Judy Garland -- who could craft emotions so specifically that each melody became a separate performance. I think songwriting's not done once it's written. I put a lot of responsibility on myself to the performance of it and orchestrating that just by virtue of my own body, my own physical expression, my voice, everything that one can see in a live setting. All my theatre [training] is directed towards how I do my music now. There's a lot of freedom in that because I can be the playwright to the songs -- "What is this character feeling right now?" Be in the moment with that character. 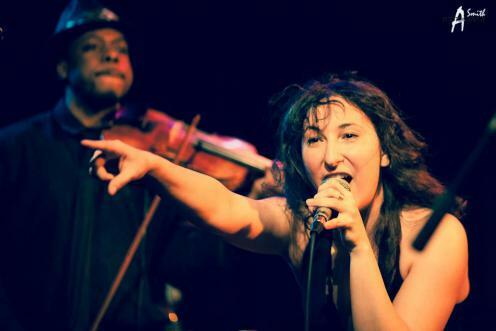 SJATM also imbues its music with distinctive gypsy elements culled from Sylvana's Romanian background (her grandfather, Claude Romano, was an acclaimed composer in his home country). Whether cavorting around the stage, striking a dramatic piano sting, or simply raising an eyebrow a la the screwball comedy heroines of yore, Sylvana entices her audience with every movement via her own particular brand of otherworldly seduction. Well-chosen through a serendipitous Craigslist ad, SJATM's individual band members bring a unique wizardry to their art. Chris King, a splendidly effective singer-songwriter in his own right, is a soulful powerhouse on guitar and vocals. Pete Bellomo's jovial spirit hits you straight in the heart as he plays his bass (he also sings opera). Drummer Ross Liberti's percussive beats have an indescribably versatile force -- and that's performing with an injured hand. Then there's Sean-David Cunningham, purely and simply a master magician on the violin. When they join Sylvana in a boisterous jazz symphony, expect all the humor, adventure, and inexplicable chills of the world's best roller-coaster ride. I was pretty blunt about the fact that I wanted the chance to make this serious. I wouldn't say it's something everybody has the privilege of succeeding at. We've had setbacks, but there always seems to be some divot of possibility lurking. It's scary how things worked out so well. It's true that since its inception in 2010 The Moment has gained some amazing momentum. Among various plaudits, SJATM garnered MTV's Needle in the Haystack Artist of the Week award in 2011, won Boston's No Contracts Needed Battle of the Bands in 2012, and released their debut album For You, Comrade last November. (They've also recorded newer material in a less family-friendly EP entitled F#@kMe!, part of a free session included in the band's Boston win.) In August the group will appear at the star-studded Musikfest in Bethlehem, Pennsylvania, and this fall Sylvana will be featured on an episode of NBC's The Jimmy Lloyd Songwriter Showcase performing her signature tune "The Break." It can be disheartening in New York City [for an indie band]. There are very few opportunities where you aren't just cleaned out financially, where you have to pay to play. We career musicians [just starting out] don't have enough opportunities to share our craft on a professional level. I like experiences where people can come to a free show and then maybe spend money on merchandise, or a CD, or something [that goes] back to the band [instead of to the venue or promoter]. The myriad levels of industrial competition have encouraged Sylvana to seek alternative markets. SJATM is entirely self-managed; For You, Comrade was funded completely through fan donations to Kickstarter; and, the crush of social media aside -- though YouTube videos documenting "The Spazzy Singer" are hilarious -- the band tends to glean its most ardent new fans from collaborations with other musicians. "I love open mics!" Sylvana enthuses. In addition to everything else, she hosts The Inspired Word "Unplugged," a weekly open mic series on the Lower East Side founded by Mike Geffner. They give people a no-pressure atmosphere to workshop things that they don't feel are perfect yet in front of an audience of people who are doing the same. And everybody that comes back, I hear them improve. I see the artists growing and I just think that open mics are where the New York scene is really going to get its wings back. To that end, this busy lady and her compatriots aim to share the spiritual wealth through showcases like Kings and Queens, which provided multiple indie acts the chance to see and be seen by their peers. From pulsating feel-good ensembles Parlance and Big Wake to standout soloists including Adam Bohanan, Marc Montfleury, and Valerie Reaper, the marathon evening never lacked for passion or pleasure. (No offense to the kings, but the queens truly held their court that night -- along with Valerie and Sylvana, Phoebe Novak and Janna Pelle are welcome bursts of joyful noise.) When we support each other, the sole direction is upward, happiness the only end. Sylvana continues to fulfill her vision as SJATM hurtles on its exciting track -- she plans to tour more broadly this year, with goals to appear at South by Southwest and to play on late-night television. "Persistence is key," she notes. "It's about sharing the music with other people, ultimately." Amen, sister. If persistence leads to more events like Kings and Queens, I'm all for it. Long live La Vie Boheme.